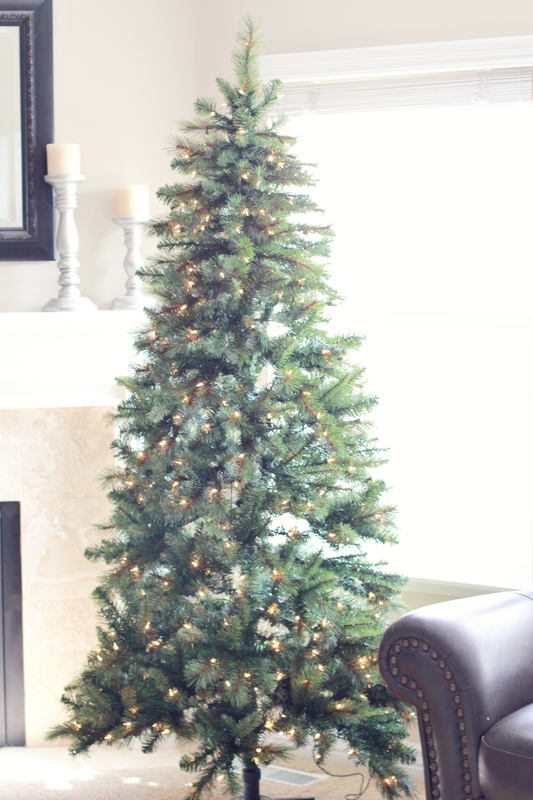 Michael’s Dream Christmas Tree Challenge 2013 *Reveal! 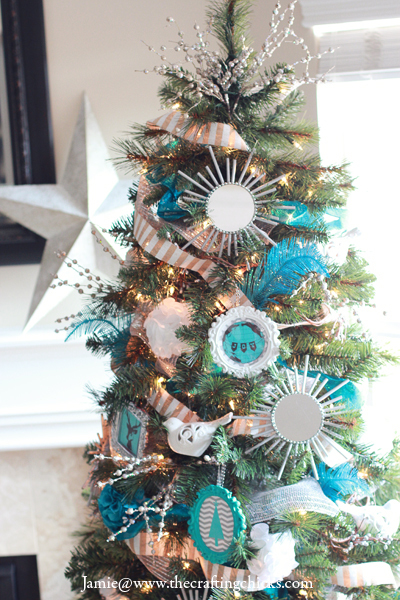 I’m so excited to reveal my Michael’s Dream Tree! We loved being able to participate again this year. 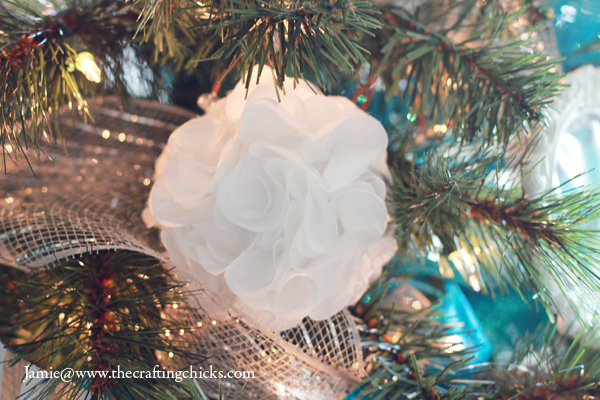 I found all of my items for my tree at Michaels Craft Stores. 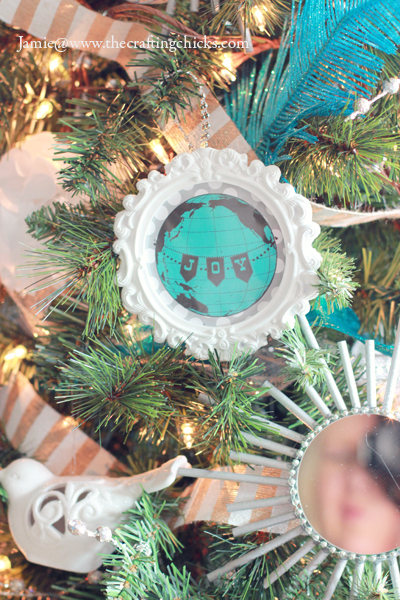 I love homemade ornaments & below I will share how I made 3 different ones for my Dream Tree. 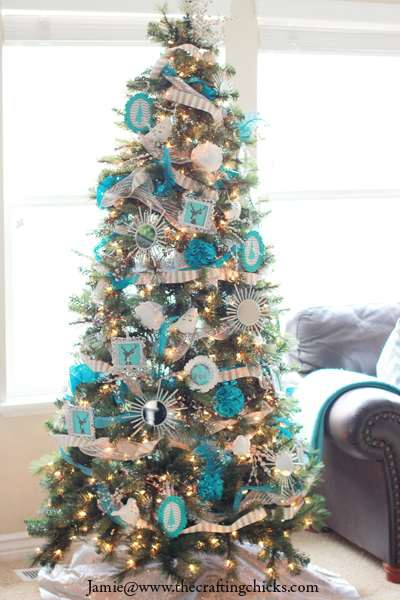 I LOVE how the blues, silver & white in my new tree design tie into our family room. Sharing all of the details below! 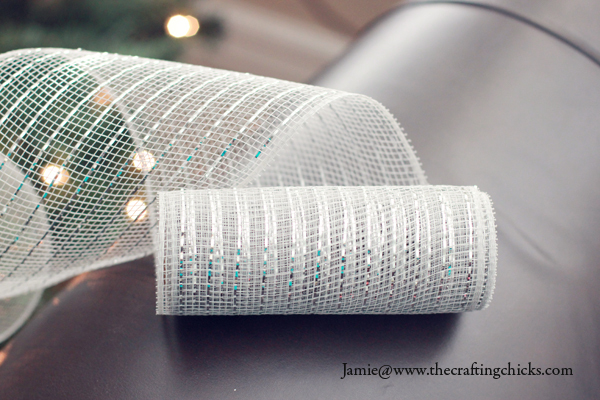 First I started decorating my tree using shinny silver mesh ribbon, silver beaded garland, & blue shiny ribbon. I took each one and wrapped a layer on the tree. The key is to push the ribbon into the the tree. 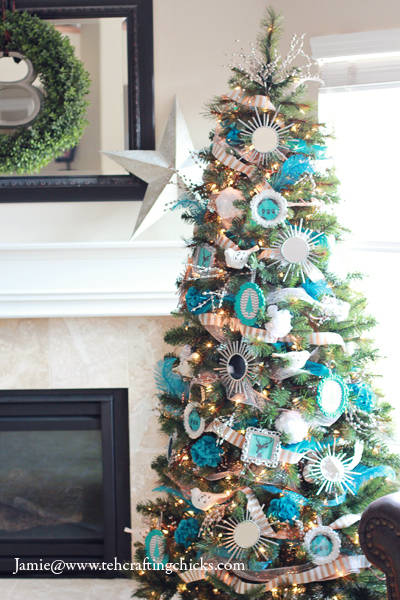 This will give it depth and allow space for ornaments. 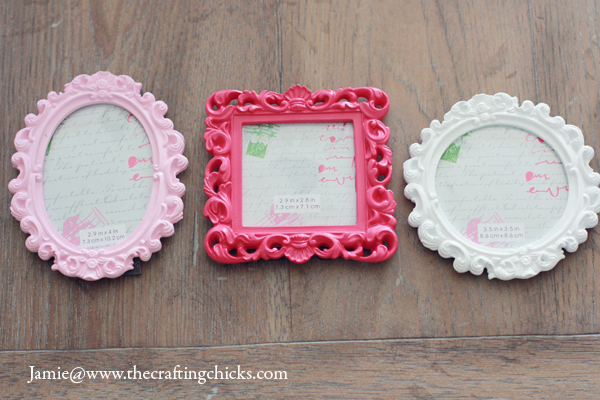 I found these adorable frames…just $2 a piece! 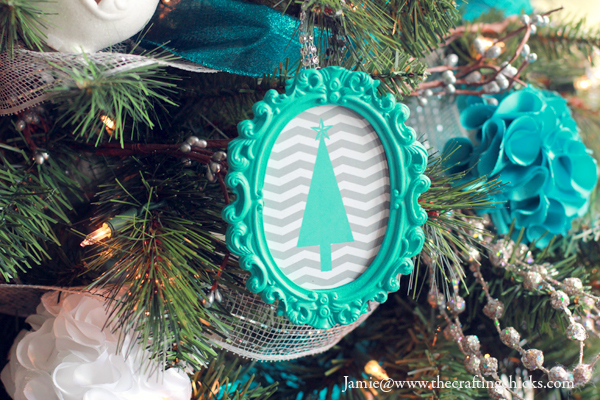 I LOVE frames on trees but since I didn’t need pink for my tree…I broke out the spray paint. 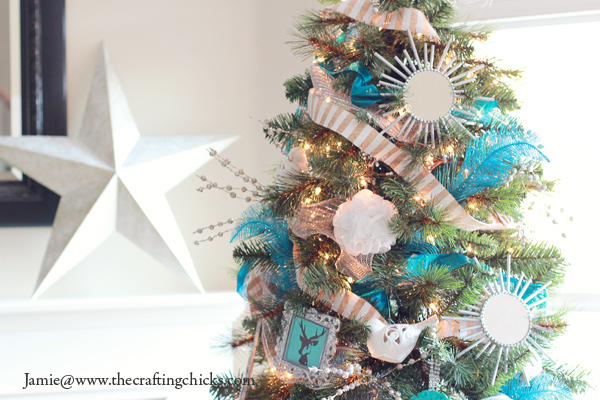 You can see how I changed the colors to match my tree. 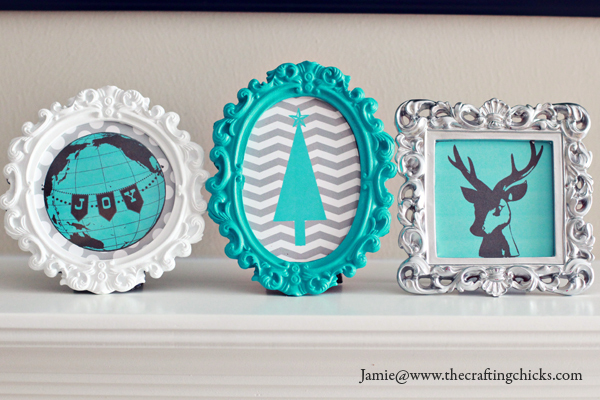 I also used Rhonna Designs’ Christmas images to make these mini pictures for the frames. 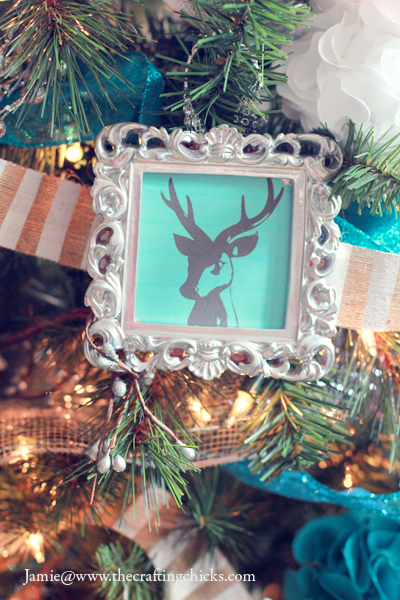 I LOVE that reindeer! 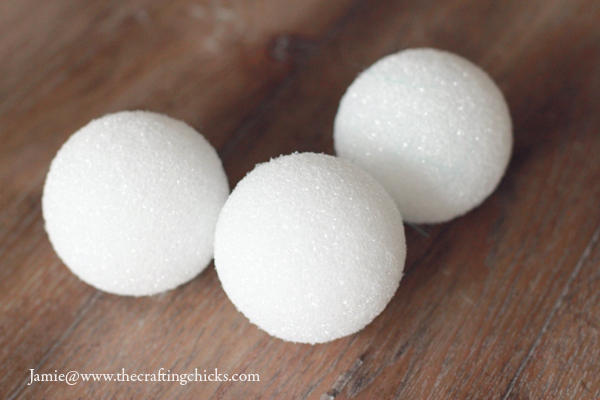 I made mini “silky” pom poms for my tree using 3 inch foam balls I found at Michaels. 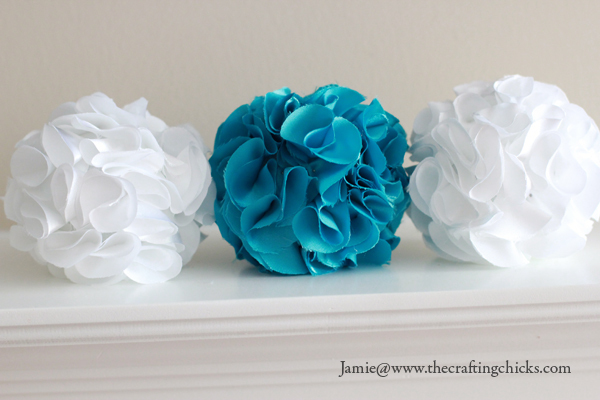 I followed this easy pom pom tutorial. 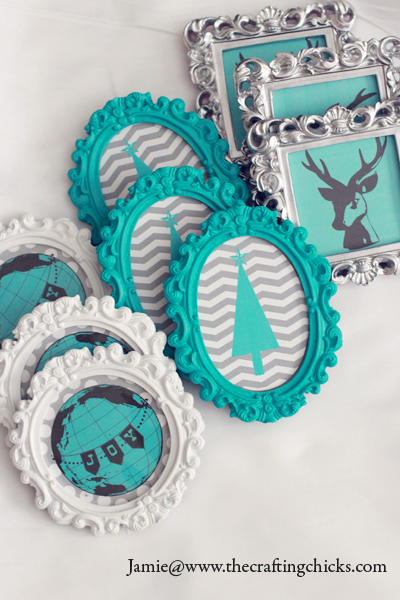 These add a bit of “Fancy-shmancy” to the tree. I used a 1.5 inch circle as a pattern. 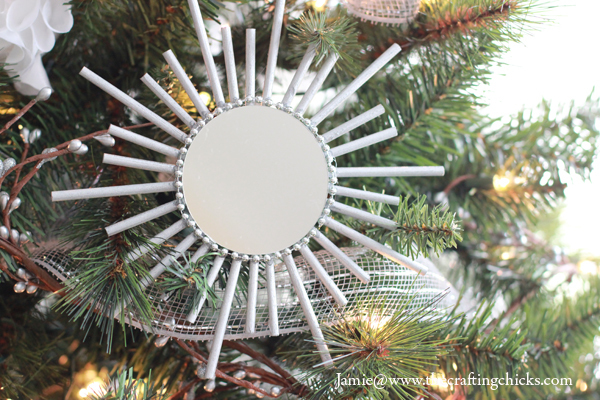 And my favorite ornaments….homemade sunburst mirror ornaments! These were so fun and easy to make! 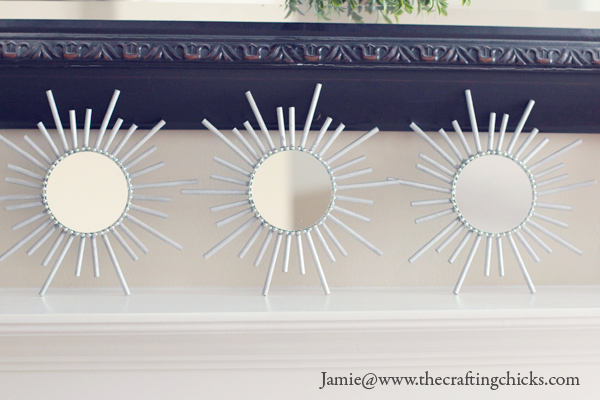 I will be sharing how to make these mini sunburst mirrors next week with the full tutorial. 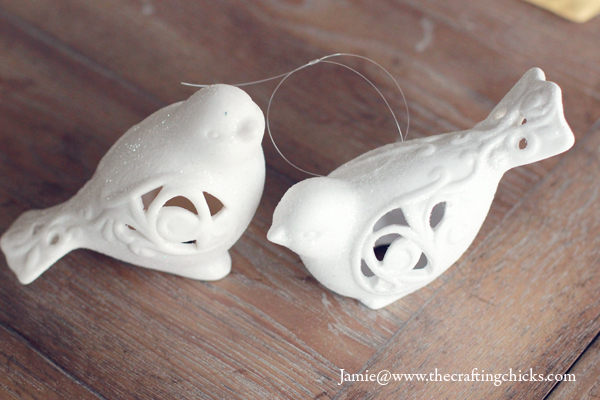 I fell in love with these mini ceramic, white, sparkly birds. 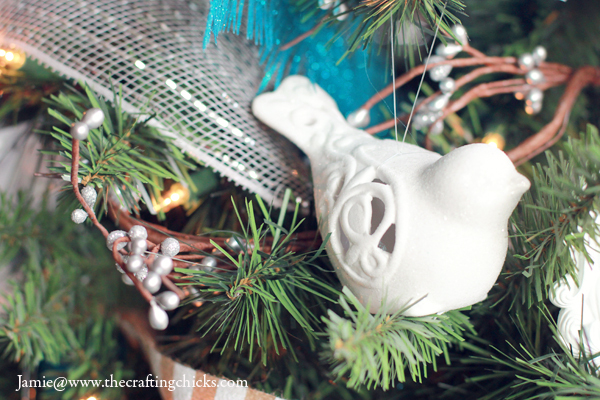 I just added some clear string to the top and voila…hanging beautiful bird ornaments. 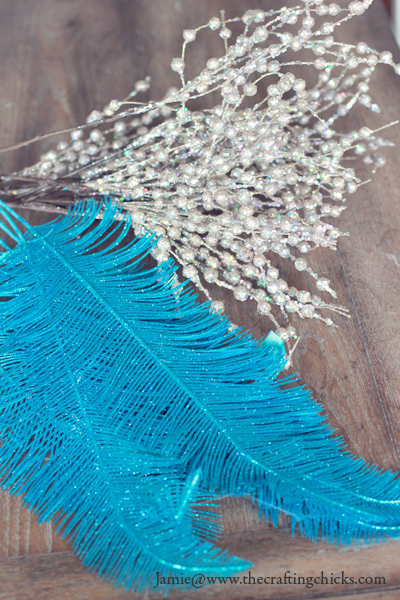 And I topped it off with several of these pretties…feathers and sparkly sprays. 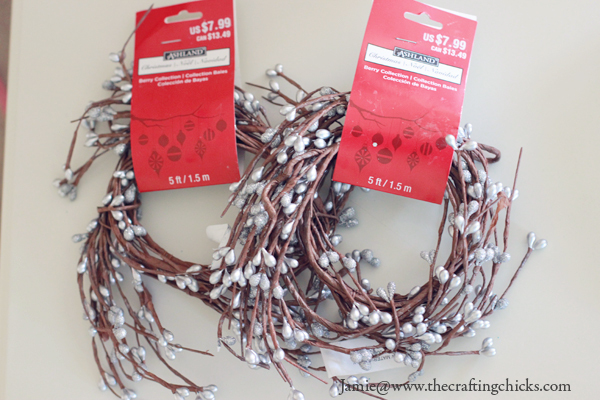 I truly was blown away at the Christmas decor ideas at Michaels this year! The possibilities were endless! 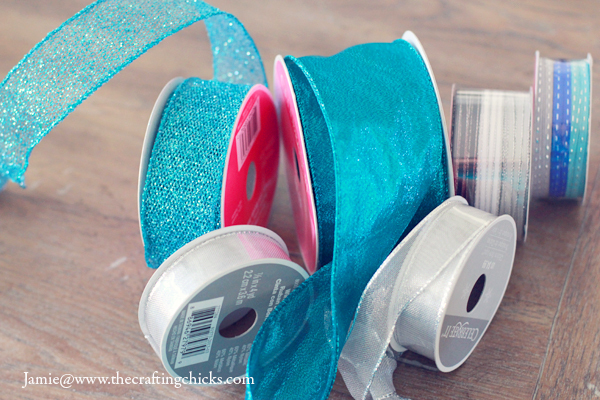 Fun little tidbits to know when shopping at Michaels this holiday season! 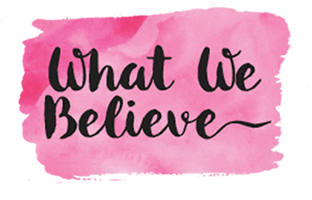 · Need inspiration about what to put under the tree for your kids this year? Check out the Michaels Holiday Gift Guide – with tons of present ideas, including the must-have gift this season, the original Rainbow Loom! Beautiful! 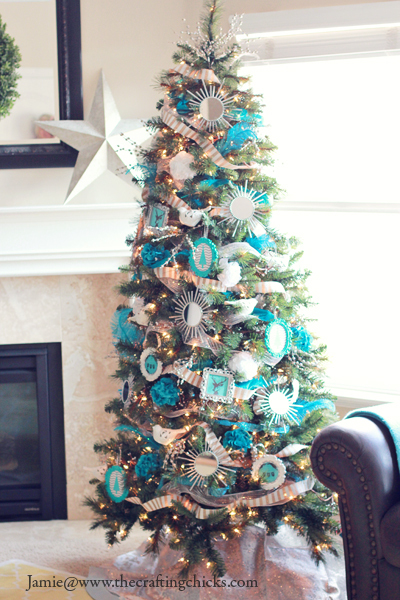 Our tree used to be in turquoise in silver, but it didn’t look half this good 🙂 I love the handmade touches, too. I’ll definitely be adapting your ideas to fit our new color scheme. It’s beautiful! Love those mini sunburst mirrors. Great job Jamie! I am loving the blue!! So many great little details and I love the frames!